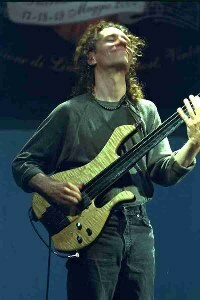 Michael Manring is the master of EBow on fretless bass. Many ask us when will you make an EBow for bass but Michael just laughs. "You've got a bass EBow right here." He plays two EBows at once and has one tune that uses three at the same time and he plays it live. His album "Thonk" is filled with EBow. Michael Manring - Instructional Video Includes EBow on bass. Michael Manring - Beyond genres and niches Some talk of the EBow. Search for "bow" on the page to find mentions of the EBow.